Project Euler #159: Digital root sums of factorisations. A composite number can be factored many different ways. Recall that the digital root of a number, in base , is found by adding together the digits of that number, and repeating that process until a number is arrived at that is less than . Thus the digital root of is . 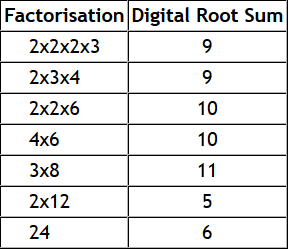 We shall call a Digital Root Sum () the sum of the digital roots of the individual factors of our number. The chart below demonstrates all of the values for . The maximum Digital Root Sum of is . The function gives the maximum Digital Root Sum of . So . First line of each file contains an integer which is the number of testcases. lines follow, each containing one integer . Output lines, one for each testcase.